In the 1980s, a 21-year-old Rich Richardson found himself lying in a hospital bed after a serious motorcycle accident in Hollywood left him with plates and pins throughout his body. It was then that he had this epiphany: He would dedicate his life to the arts, something he genuinely enjoyed. Having only dabbled in screen-printing himself, deciding that art would be at the epicenter of his life was a bold change. After recovering from his motorcycle accident, Richardson struggled to find an entry-level job in the San Francisco area that could fuel his creativity and artistic visions. He eventually moved to Honolulu in 1999, after a short stint living on Maui with his brother and sister. Part of the reason he chose to relocate to Hawai‘i was that he was searching for a deeper connection with nature and a healing environment. In Honolulu, what Richardson discovered instead was the dilapidated and generally avoided district of Chinatown. While many saw it as a volatile no man’s land tucked between traditional food markets and the financial district, Richardson saw a diamond in the rough and created a two-year plan to reinvigorate Chinatown. Shortly after his arrival in Honolulu, Richardson was invited to a show at a gallery called Sisu, located on Nuuanu Avenue. He immediately felt a deep connection to the space, and in 1999, when the former owner called him to propose a takeover, he jumped at the chance. He renamed it it Salon5, a nod to his aspiration to popularize cutting-edge art, and installed quirky exhibitions, including one that depicted celebrity haircuts and another that led viewers on an urban fountain swim tour. 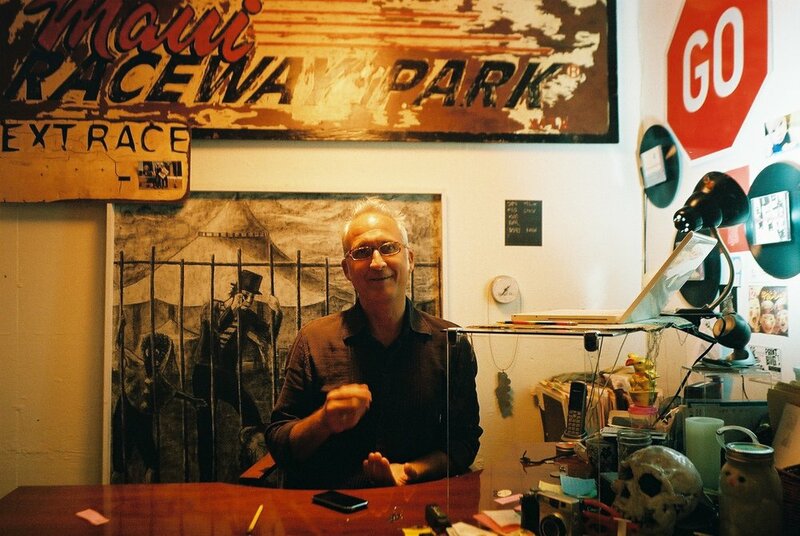 Despite a lack of immediate fans and customers for this progressive form of art, the gallery gave him the chance to organize events and cultivate a creative community in Chinatown. Richardson organized shows with local contemporary visual artists, enhanced by performance arts and some wild opening nights. When he closed the doors of Salon5, it propelled him to explore other possibilities within Chinatown. In 2001, Hawai‘i Craftsmen and Hawai‘i Arts Alliance founded The ARTS at Marks Garage, an open gallery often filled with creations from local artists, and he was appointed the “gallery guy,” painting the bare walls and organizing opening night parties. While he started as an independent contractor with the space, he has grown along with it and is now the executive director of The ARTS at Marks Garage, which has expanded to include creative classes in a variety of fields and an array of shows ranging form open mic nights to large-scale project presentations throughout the week. Richardson’s involvement in the arts doesn’t stop at ARTS at Marks. He is also the executive director of Hawai‘i Academy of Performing Arts, an organization that offers lessons in theatre, arts, music, and dance, and the founder of the Chinatown Artist Lofts, a creative collective of artists who live in private studios and open their doors to the public during events like First Friday (the popular monthly Chinatown event that Richardson co-founded in 2003).